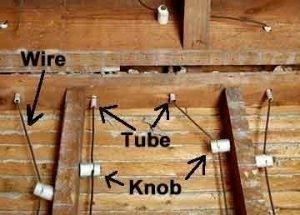 A Knob-and-Tube Wiring Refresher: Why It Should Be Replaced | Anderson Electric Corp.
As electricity started entering homes in the 1880s, knob-and-tube wiring was an easy way to set up wires. The wires pass through a series of ceramic tubes in the joists and other wooden parts of the house, and the tubes are held up by ceramic knobs. The wires string together from tube to tube, and the wires usually have rubber insulation. This seems like a strange way to wire up a house, so why was it still being put in homes up to the 1940s? It was a less expensive installation, for one, cheaper than other options available at the time, such as conduits, armored cables, and metal junction boxes. These cost two to three times more than using knob-and-tube wiring. This was before more standardized wiring regulations came into existence and the danger of knob-and-tube wiring started to emerge. As soon as plastic insulated wiring and other options became inexpensive enough (as well as faster to install), there was no reason to continue to use knob-and-tube setups. Another reason knob-and-tube wiring is dangerous is because it isn’t grounded, which can create a dangerous situation in the event of a power surge, possibly leading to electrical fires The situation becomes more serious if a home has had modern wiring put in alongside the rubber wires of knob-and-tube setups. This is against the electrical code—one of many reasons you never want to have amateurs work on your home’s wiring—because the combination of different materials that heat and expand at different rates is dangerous. Even if this wiring was safe—and to be clear, it’s not—we still recommend replacing it entirely because of amperage. The demand of the many modern appliances in homes is simply too much for this wiring to handle, making it vital to have the wiring up to code. And while we’re here, we’ll mention that upgrading from old two-prong outlets to grounded three-prong outlets is also advised when you have rewiring done. For help with knob-and-tube wiring replacement in Clifton, NJ or elsewhere in Northern New Jersey, schedule an appointment with us. Anderson Electric Corp. has over 25 years of experience with electrical services in Northern New Jersey. Call us for a free estimate today.